The 35th Infantry Regiment Association salutes our fallen brother, CPL Richard Wayne McGee, 16795107, who died in the service of his country on July 1st, 1966. The cause of death was listed as small arms fire. At the time of his death Richard was 19 years of age. He was from Gary, Indiana. Richard is honored on the Vietnam Veterans Memorial at Panel 08E, Line 116. The decorations earned by CPL Richard Wayne McGee include: the Combat Infantryman Badge, the Distinguished Flying Cross, the Purple Heart, the Air Medal, the National Defense Service Medal, the Vietnam Service Medal, the Vietnam Campaign Medal and the Vietnam Cross of Gallantry with Palm Unit Citation. While a member of A Co 2/35, Richard volunteered for Shotgun duty in 1965. Upon completion of his TDY, he requested reassignment to remain with A Co 501st Aviation Bn, 71st Assault Helicopter Company. On 8 November 1965, he was awarded an Air Medal with V for heroism and went on to receive an AM 14 times. He was hit by small arms fire while on an attack mission. For heroism while participating in aerial flight: Corporal Mc Gee distinguished himself by exceptionally valorous actions on 1 July 1966 while serving as a door gunner of an armed helicopter during a reconnaissance mission near Duc Hoa, Republic of Vietnam. When his fire team received an emergency call from an observation aircraft which had located an estimated company of Viet Cong, they immediately flew to the area and engaged the insurgents. During the repeated firing passes over the fortified Viet Cong positions, Corporal Mc Gee stood on the skids of his helicopter and placed suppressive fire on the Viet Cong. Although the fire team was receiving intense ground fire from all quadrants and all the main armaments of the aircraft were expended, he continued to place effective machine gun fire on the insurgent positions. On the last firing pass, Corporal Mc Gee was mortally wounded by the intense Viet Cong ground fire. Corporal Mc Gees personal bravery and devotion to duty were in keeping with the highest traditions of the military service and reflect great credit upon himself, his unit, and the United States Army. P.S. Pray for me and if the Lord is willing,well all be together on Christmas. I served with Richard McGee in Hawaii with the 25th Division. I arrived in Hawaii in January of 1965. I know our enlistment dates were within months of each other. I lied about my age and joined the Army at 16 years old, in September 1964. Richard wasnt much older. We were actually in the same squad. (1st squad) Company A 2nd Battalion 35th Infantry, 3rd Brigade. I signed up for the same Shotgun program Richard was in, but I was not accepted. Richard left for Vietnam around September 1965. We later deployed to Vietnam and were stationed at Pleiku. I heard but could not verify, that when Richards tour with the Shotgun program was over, he could have returned to our company, A-2-35, but chose to stay with his Door Gunner company. In June of 1966, I was wounded seriously enough to get out of the Nam and to Japan. June, July and August 1966 were bad months for our company. We had many casualties and Richard knew many of them since he had served with us in Hawaii. It was in Japan that I learned of Richards death through the Stars and Stripes. I was very saddened. Richard was top notch. I respected him very much as a person and as a soldier. He was so young and so brave. Before he left Hawaii for the Nam, he gave me one of his well tailored fatigue shirts which I wore until I was discharged in September 1967. His uniforms were always tailored and his appearance encouraged me to emulate his style. If you look at the photo of Richard on this post, you will see that he is wearing the 1st issue Vietnam fatigue shirt. The one were the buttons show through the pocket flaps. I have a photo of myself wearing the shirt that Richard gave me. It too, was the old style. I was lucky to survive the Nam. Richard died a hero, doing what he was truly meant to be.....A Door Gunner. I know he was brave on every mission he went on. The job of a Door Gunner is not for those who are afraid. Door Gunners are special and I always repected and admired them when I flew on Choppers and I thought of Richard when I looked at the face of each Door Gunner. I wish I could have seen him in the Nam. God Bless Richard and his family. He was one of a kind and is remembered by many. Its hard to believe that so many years have passed. Richard Wayne McGee and I volunteered to go to Vietnam as door gunners on helicopters. A door gunner program had been in effect since 1962. It started out with "Shotgun One" and then three months later "Shotgun Two" and then three months later "Shotgun Three" and we were on "Shotgun Eleven". Of course we didnt realize that this would be the last shotgun group to go to Vietnam because the whole 25 th Infantry Division was going to Vietnam a few months later. I didnt know Richard Wayne McGee before we started taking our 30 day training together before we went to Vietnam. We became somewhat friends during the 30 day training. The training was very, very intense. When we got to Vietnam and were assigned to the same platoon, we became really, really close. I remember him buying a guitar downtown when we were off duty we would sit in the bar and he would make up songs and strum his guitar. I know he couldnt sing and I know he couldnt�1/2he didnt know any music but the Vietnamese people in the bars didnt know that and thought he was a rock and roll star. We spent a lot of times together. He always called me "Doofus" for some reason. I made Spec 4 about three months after I got to Vietnam. When Richard made Corporal we celebrated about that and I was excited. I was a Spec 4 and he was a Corporal. Both of us were E-4s but he was a non-commissioned officer. When he was riding on a helicopter he was a professional soldier and all the pilots liked him and all the crew chiefs liked him. On the day he got killed he was on a separate mission than I was on. It was a shock to everybody and a lot of heads hung low when Richard Wayne McGee was killed. He has been on my mind all these years and every time I go to Washington, D.C. I go to the Vietnam Memorial and I do a rubbing of his name because Richard Wayne McGee from Gary, Indiana was my closest friend in Vietnam. 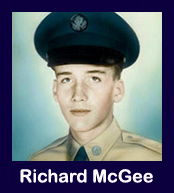 It was a dark day and a dark week when Richard Wayne McGee died that day, the first of July nineteen sixty six. Ill always remember that day. Richard Wayne McGee was 19 years old and he will always be 19. "In Loving Memory Of a Boyhood Friend Richard McGee"
two sisters, one brother and me.